This is our wonderful Lis Simon Bride Aubrey who chose a few of our separate pieces, bodice SS103 paired with skirt SS106, to wear on her special day. Congratulations to Aubrey and Brodie! Brodie and Aubrey have a modern love story. They met on a dating app by both "swiping right" and immediately hit it off. The conversation was easy and Brodie suggested they meet. The only problem was that he was flying to Scotland the next day to visit his family for a few weeks, but that didn't stop them! They chatted regularly and made plans to meet for the first time just a few hours after his flight landed back in the United States. They met up at a local brewery/restaurant seeing each other face to face for the first time. "It was one of the most exciting (and scariest) moments of my life!" After dinner, they walked around the historic "Horseshoe" at their local college campus, the University of South Carolina. Brodie knew she enjoyed studying music and playing piano, and surprised her with a key to the historical campus Rutledge Chapel. They sat and he played the piano for her and she nervously attempted to play for him. They have been inseparable ever since – 5 years later. One evening Aubrey and Brodie were getting ready to grab dinner with his family. They were on their way to the restaurant and Brodie unexpectedly pulled over at the Horseshoe, where they had gone on their first date, and asked Aubrey to get out of the car and follow him. He led her to the entrance of Rutledge Chapel, got down on one knee, and proposed. The rest is history. Aubrey's dress shopping experience did not go as she had originally expected. For a very long time, she had a Pinterest board and dreamed of her perfect wedding dress of lace, illusion neckline, 3/4 length sleeves. As soon as she was officially engaged, she raced over to a local dress shop and tried on her dream dress. She looked at herself in the mirror and felt like a little girl playing dress up. Aubrey realized her 'dream dress' was not meant for her. She took the dress off and went home, totally stumped. A few weeks later, Aubrey grabbed her mom and sister and visited Ladies of Lineage in Charlotte, NC. She shared her first experience with the salesperson and she suggested trying on different styles and seeing what worked best for her body. The first dress she handed Aubrey was fine, but it didn't offer that "wow factor" she was looking for. The salesperson looked at her, smiled, and asked if she could choose something totally different than what Aubrey had originally pulled. At this point, she was willing to try anything. The salesperson came back with two separates by Lis Simon. She stood in the dressing room, watching the salesperson fit the dress to her body, and felt overwhelming excitement and joy. This dress made of two separates was totally different than what she thought she'd be wearing on her wedding day, but after trying on two other dresses, she turned to the salesperson and said "Can I put those separates back on? One more time?" She looked at herself and knew she had found her wedding dress! 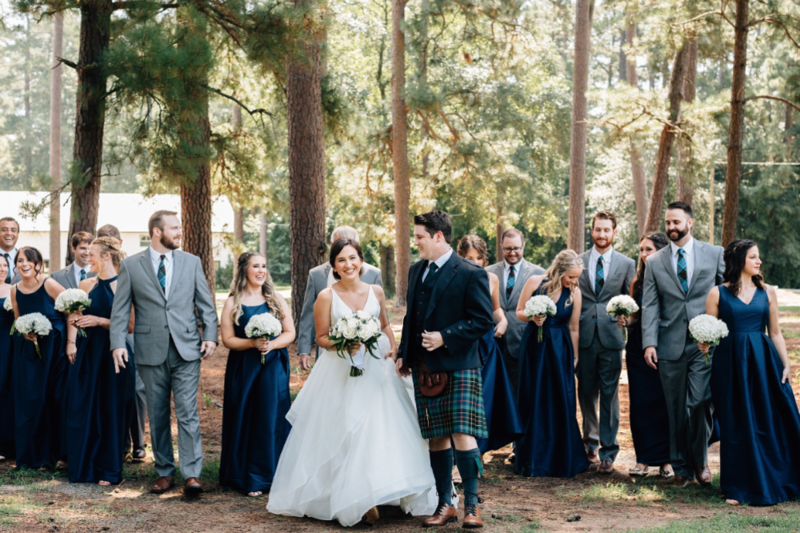 Aubrey and Brodie got married on July 28, 2018 at the Sacred Heart Roman Catholic Church in Pinehurst, North Carolina. Their reception was held in the Fair Barn and was extremely fun. They had a wild dance floor, a bar filled with craft beers and wine (including exorbitant amounts of rosé), and tons of foam light up sticks and glow bracelets. "Looking back, I wouldn't have changed a single thing. It was the best night of my life." My favourite part of our wedding reception was when we celebrated some of my family's Polish Traditions. Of all the customs associated with a Polish wedding, there is none more significant than the Oczepiny [O-chee-pee-ni] Ceremony, or the unveiling of the bride. Surrounded by my attendants and accompanied by the guests singing 'Rosnie Trawka' or 'The Twelve Angels Waltz.' Also during this time, Brodie was serenaded to 'For He's a Jolly Good Fellow," while a silly hat was placed on his head – wishing the newly married couple laughter and joy in their new life together. Being hoisted in chairs by our friends and family and carried around the dancefloor - looking at my husband in a kilt and a silly vegetable hat - was absolutely hilarious, somewhat ridiculous, and a LOT of fun. The pictures are a riot as well. Aubrey's and Brodie's family heritage and traditions are incredibly important to both of them. His mother is from Edinburgh, Scotland, and his father is a minister who was working in Edinburgh when he met Brodie's mother. They fell in love, got married, and moved to the United States. Brodie's mother's maiden name is 'Brodie.' The Brodie family has a 'Brodie Tartan' that the family proudly wears on special occasions. Brodie's grandfather had a kilt made in the Brodie Tartan for his wedding almost 70 years ago. Brodie's uncle wore the same kilt on his wedding day. 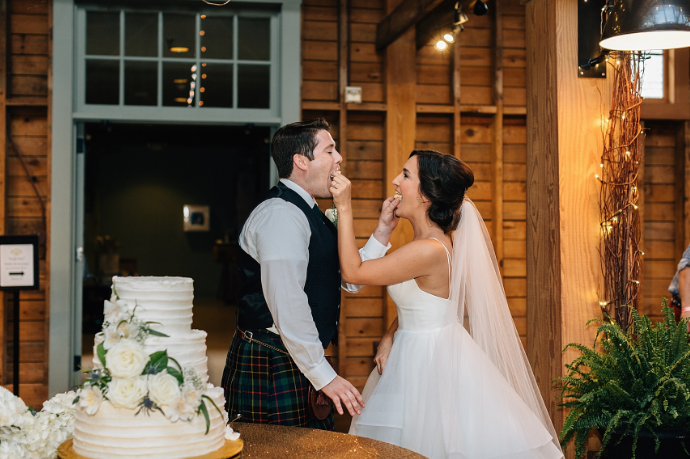 Brodie wore that kilt on their wedding day! Aubrey used the Brodie Ancient Hunting Tartan fabric to guide their colour scheme (navy blues, forest greens, off-whites, etc.) The decor they used for their reception consisted of a lot of white and gold with hydrangea, magnolia, and white rose accents!. Honeymoon destination: La Habana, Cuba. W o r d s f r o m t h e b r i d e .
Listen to your mother, sometimes she really does know best.